Recorded Live on Stillstream.com on April Fools Day 2011 (04.01.11) on the dark ambient experimental net radio program Sadayatana. This live set was mostly improvised using Absynth, Reaktor, and field recordings. Listeners will find a more reserved and minimal approach with sounds that could be described as dark ambient, electronic, and experimental. 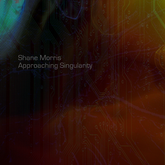 Approaching Singularity is an instrumental concept album based on the hypothesis of technological singularity proposed by I.J.Good and Vernor Vinge. As the world progresses, it seems inevitable that at some point, if we do not destroy overselves, for better or for worse, this singularity will occur. This is an album inspired by these concepts and the potential outcome it proposes for the future of the human species. Created and Produced by Shane Morris © 2011 released under a Creative Commons license for free non-commercial use as long as certain conditions are met. That's because Norway is awesome.